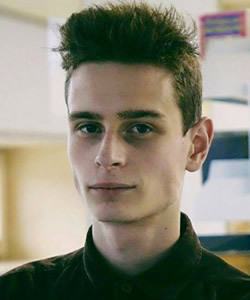 Background: As part of the Education and Social Justice Project, in July 2017 undergraduate student Anastasia Sendoun interviewed Andriy Rubtsov, a Ukrainian Catholic University (UCU) student serving as student government president. In this interview, he discusses his experiences at Ukrainian Catholic University and his views on social justice. Rubtsov identifies changing norms related to gender equality as particularly important for achieving social justice. My name is Andriy, and I am 19 years old. I am the president of the student government at UCU, and I am also an intern in the recruitment division of the university. I am in my third year of studying social pedagogy and hope to later study journalism. Can you tell me a little about your personal experience with the system of higher education in Ukraine? For me, the transition between the secondary school and university was very impactful. When I got to UCU, I realized that my education in high school and the education at UCU were diametrically different things. For example, in school, the old Soviet system was still very much in play, and there you are not treated as an equal, but as inferior. When you get to UCU, you realize how education is supposed to be, how students and professors are supposed to interact. What is the greatest strength of the Ukrainian education system, and what is the greatest weakness? The greatest weakness of the Ukrainian system of education is that it is outdated. We are unable to let go of the past, and we still have these old Soviet notions about how a student should be, how a professor should be. I think these ideas should be left behind so that we can move into the future. The greatest strength is its young specialists, especially those who are working to introduce new ideas into existing structures, people who are trying to reform the system. Personally, when I hear the phrase “social justice,” this means that everyone is equal both in terms of legal rights and other rights in society. Social justice also means social responsibility. In the case of Ukraine, I think we are on the path to social justice, but we are not there yet. The older generation does not want to let go of certain ideals, certain values—if we can call these beliefs “values.” But the younger generation understands better: for example, that it’s okay if a woman earns more than a man, or if she does not want to stay at home. Until we let go of some of these old ways of thinking, we will not be able to make progress. What are some challenges to social justice in Ukraine today, and are these challenges interconnected? Some challenges I see to social justice include the rights of women, in terms of how women are treated day-to-day. Their rights are often not respected. Another challenge is achieving equality between different cultural institutions. Broadly, achieving equality is the biggest social justice challenge in Ukraine. Oftentimes, people do not want to have conversations around these topics. Young people are the ones trying to encourage dialogue between different people and to show that the differences between people are not as insurmountable as people think. This is a difficult task because if someone spends their entire life thinking one thing, it is very difficult to reverse this thinking. Must of this thinking comes from fear and uncertainty. How do you envision the future of Ukraine, and what do you think the role of the Ukrainian Catholic University will be in that future? I think UCU will serve to orient other universities—I want other universities to strive to be more like UCU and to adopt UCU’s model. In terms of the role of UCU in the future of Ukraine, I hope that people understand that they are able to bring about change. With the conflict in the east now, I am not sure if this will happen. But I think in five or 10 years, things will be better in the country. People often say things like “It was better in the past.” Things may have been better in Ukraine’s past, but things should be even better in its future. Every year, there are more graduates of UCU. These people are already starting to positively change the places where they work. I have hope that things will be better in the future.